With the UK General Election looming, it’s time to consider the politics of football. Some argue it has no place in our game, but I want to convince you that there has never been a greater reason for football supporters to get political. It’s a privilege to be around at the birth of a movement. Even when viewed from a distance you can not help but be inspired by the coming together of millions of people in a common purpose. In my life I have been fortunate to have lived through many. The collapse of the Berlin Wall under the weight of countless East German citizens swinging pick axes and sledge hammers, their oppressors powerless to stop them, was a truly jaw dropping moment. Likewise the end of Apartheid, the abolition of the Poll-Tax, the peace settlement in Northern Ireland all spoke of the power of ordinary people all over the world saying enough is enough! Different movements with different aims in disparate parts of the globe, but they all have one thing in common for me. Each of these epoch defining monoliths were said to be immovable and permanent. That is until the masses decided they had other ideas. I grew up being told that ‘you can’t beat the system’, that those who have the power will never let go. This ‘It’ll never work’ attitude frustrated me as much back then as it does today. Then one evening I sat in disbelief, as I watched a single Chinese Student bring a column of tanks to a halt in Tiananman Square. That powerful iconic image, beamed around the world blew that old argument out of the water. In reality it has always been this way. I can’t think of a single advance in the rights or freedoms of ordinary people that hasn’t been won through struggle. To put it simply those in control of the power never relinquish it voluntarily. If we want reform of any kind we have to campaign for it. Sometimes that involves sacrifice. It always involves collective effort. Shankly himself said “I believe the only way to achieve success in life is through collective effort”. Central to Shankly’s philosophy was the notion that as individuals we can only achieve so much, but there is strength in unity and common purpose. This ‘Spirit of Shankly’ gave rise to another great movement and it has led to the ‘politicisation’ of a significant number of Liverpool fans over the last decade. When it comes to politics most of us, if we engage at all, will get involved in the ‘big ticket issues’. This week Russell Brand interviewed Ed Milliband on the Trews. Whatever you think of either of them, what they both said really resonated for me. They talked of a new politics, of community activism bringing pressure to bear on governments and political parties and ending the power of rich lobbyists. In Liverpool we have been demonstrating the power of community activism for twenty five years. There would have been no Hillsborough Independent Panel or Inquests without ordinary supporters and the families of the bereaved coming together and refusing to give in. A certain ‘newspaper’ would still be on sale in our shops, if it wasn’t for a mass boycott that has remained gloriously solid throughout all of that period. Liverpool supporters are well versed in collective effort and community activism and they have made the establishment sit up and take notice. 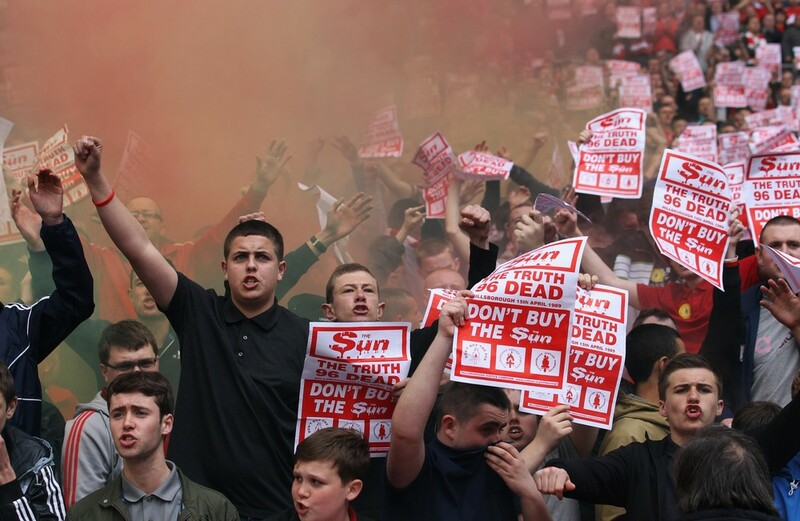 It is therefore no surprise to me that Liverpool supporters are in the vanguard of the movement against obscenely inflated ticket prices. Up to a thousand of them boycotted an way match at Hull. This was a tremendous show of strength and a model for football supporters of all clubs. Ours is a truly grass-roots campaign and that’s where its power lies. 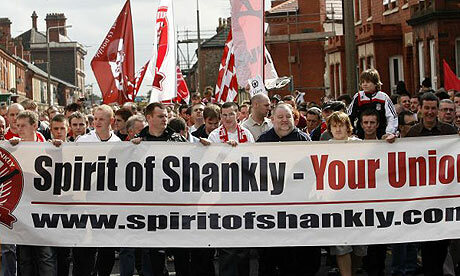 I remember the formation of Spirit of Shankly. The union grew out of desire to rid the club of Hicks and Gillett and place supporter at the heart of decisions made about the club. At the time they drew criticism from sections of our own support. Complaints ranged from the ‘you can’t fight city hall’ argument to criticisms of their grammar. Some even argued that politics, unions and demonstrations had no place in football or sport in general. Then there were those who suggested we should look to the ‘professional’ campaigns being organised by United fans to get rid of the Glasers, rather than the jeans and trainers campaigners that were the masterminds of SOS. All I will say on this subject is look at where those respective campaigns are today. While United fans were being urged to wear multi-coloured scarves, SOS were busy organising a global campaign that struck fear into the hearts of anyone thinking of lending our Tom and George any money. So effective was this movement that Hicks himself was forced to acknowledge he had been undone by a bunch of ‘internet terrorists’. As we survey the fallout we have rid ourselves of Tom and George, while the Glasers grip on United is as strong as the debt on their books. What’s happened to the green and gold scarves? The fact is SOS have gone on to greater heights, joining forces with Spion Kop 1906 and taking on the cartels controlling ticket prices. The club have been forced to listen and other supporters around the country are uniting to bring pressure to bear. It collectivism. It’s community activism and it’s working. We can all see the logic of mass movements on issues as big as the right to vote. Ending corrupt states through mass demonstrations resonates with most of us. We will even contemplate civil disobedience when faced with unjust laws or infringements on civil liberties. Maybe injustice in sport seems too trivial to justify such a passionate response. I would strongly disagree. Yes we may have come to terms with the fact that football is not more important than life or death, but it’s still very important. Think about how much time and energy you invest in the game, let alone the money. Whole communities are built around football teams. Think about what Liverpool Football Club means to you, how passionate you feel about it, the joy it has brought you and the crushing despair. Your team is as much a part of your life as your job, maybe more so. You would fight to defend your job. Why wouldn’t you do the same to defend your club, or your right to watch your club. As Brand said, after his much publicised chat with Ed, Democracy is for every day. I believe he is right. It’s for the big stuff and the little stuff. The only way we can secure the things that matter most to us is to engage with politics and become activists. There can be no suggestion any more that football isn’t political. Stadium disasters all over the world tell us it is. Allegations of corruption at the heart of FIFA and the usurping of our clubs by the rich and powerful tell us that football is deeply political. In Europe there are different models of ownership where fans have a greater say in the running of their clubs. Why can’t we have that here? Could a foreign owner take over a club in the Bundesliga and change its badge or name without the fans consent? Why can’t we enjoy the same protection? The Premier League is staring down the barrel of unimaginable wealth, yet it sees fit to price the ordinary fan out of the game. How can this be allowed to happen? Whether you like it or not, these are all political questions. On our own we can moan about the situation, but we can not change it. Together we can. For too long football supporters have been happy to leave the running of their most cherished pastime to others, content to pay whatever it takes for the privilege of watching their heroes. Football is never going to be free, but it has to be affordable if the lifeblood of the game, the supporters are to keep up. Fans are realists. 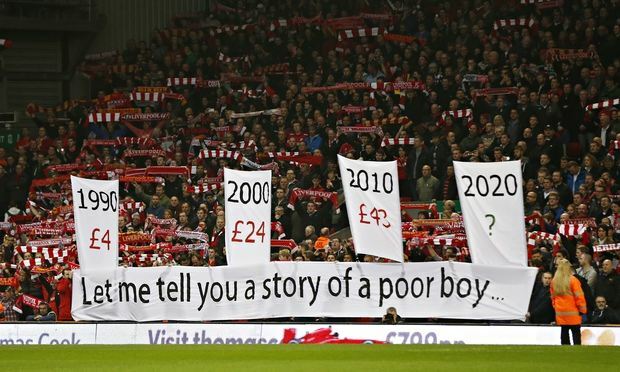 They appreciate clubs have to turn a profit, but it’s the sense that we are being fleeced that angers many of us. Shankly also talked of a world where everybody worked for each other and everybody shared in the rewards at the end of the day. We are light years from this vision in my view. Instead, most of us are watching from the sidelines as our clubs disappear over the horizon. It’s time to reclaim our game and that means getting political. It means coming together with like minded supporters and campaigning. It means lobbying your MP or Councillor. It means marching or even boycotting games. You don’t have to join a supporters union to do any of this, but think how powerful we would be if we all did. I want my kids and eventually my future grand-kids to be able to afford to go the game long after I’m gone. I want them to be treated fairly by the clubs they support and to be safe when they go the game. I want the communities in which our teams are rooted to be respected and for our grounds to be community assets. In my view there is nothing more political than that and it’s time we all woke up to that fact.